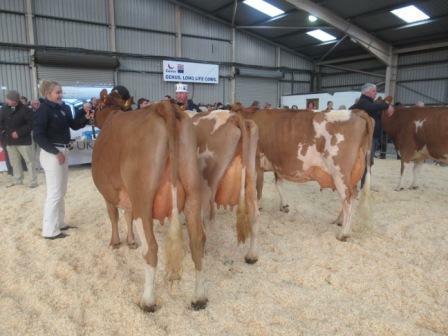 The Welsh Dairy Show was held on Tuesday October 30th at the United Counties Showground, Carmarthen. 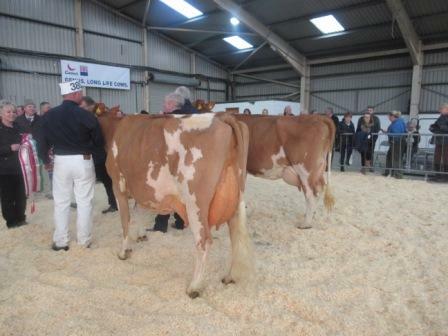 There were six animals forward from three Exhibitors, and thanks must go to them for keeping a Guernsey presence at the Show. It was my pleasure to be asked to judge at this years show and although the numbers were low, this did not detract from the quality of individuals put before me. 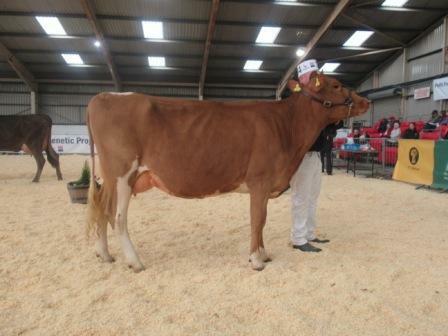 The first class, Heifer in milk, had one entry and that was Glanmor Legend Okapi from Glanmor Jerseys. She was a very balanced heifer, with dairy quality throughout. She walked well and had the promise of a very bright future one she calves again. The Junior cow class had two animals forward. In first place was Brymor Westword 50 by Phonze from Glanmor Jerseys, who displayed lovely dairyness, fineness of bone and a well attached udder. She paraded well and this gave her the advantage over my second placed cow, Brymor Peggy 50 by Cadbury Pretty’s Wizzard from Richard Norman, who unfortunately did not want to show herself off. None the less, she was a very correct cow, who although had been calved twelve months, still carried a good vessel of milk. 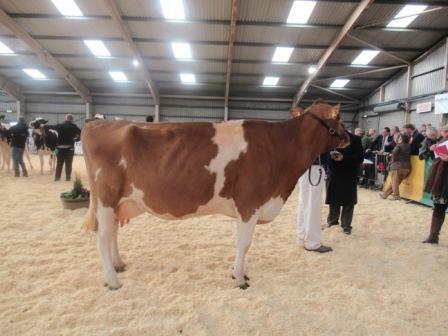 There was one intermediate cow forward and that was Bickfield Linda 68 by Andante from Richard Norman. This third calver has matured into a powerful cow after being Champion Calf at ABAB in 2015. The Senior Cow Class had two entries and as I had had a previous interest in one of them, I asked David Mann, who had been judging calves on the Tuesday evening, to step in and referee. 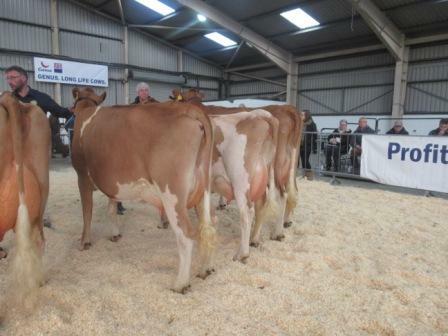 In first place was Briddlesford Laredo’s Bluebell from the Cox and Evans Families. 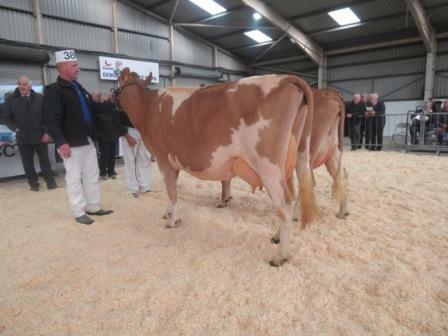 This fifth calver was well balanced throughout, paraded well and oozed dairyness from head to toe. 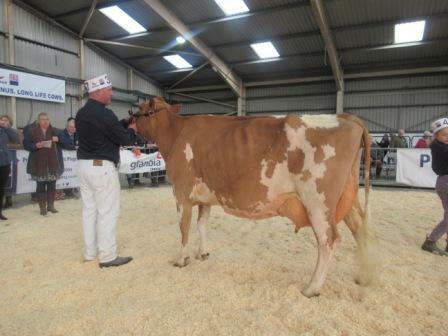 She had the advantage over Bourton Fiona 13 by Double L from Richard Norman in her strength and stature. The second placed cow was again very dairy and had a very snug udder for a fourth calver. 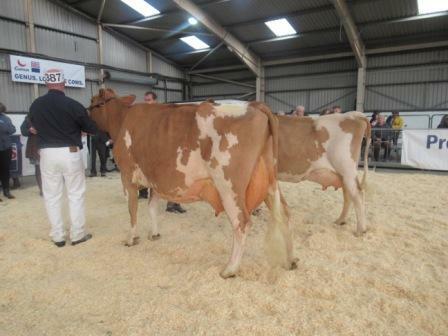 These two individuals were very different but both were great examples of the modern Guernsey Cow. Two groups of three saw the Glanmor Jerseys group have the edge over Richard Normans group. In the Championship, I had no hesitation in awarding my Senior cow, Briddleford Laredo’s Bluebell the Top Prize and once again I asked David to step in as I wanted to place the Intermediate cow, Bickfield Linda 68, Reserve to which he agreed. 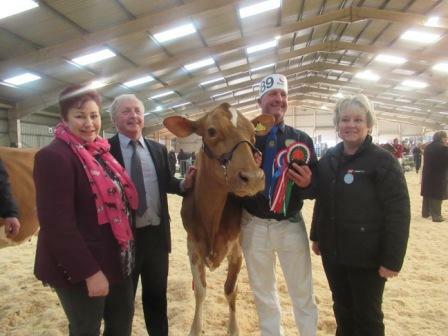 Owners, Daf Cox, Colin Evans, Sponsor of the classes and Kim Sales with the Champion Cow. Thank you to all the exhibitors for turning out on a very cold day and also Congratulations to Glanmor Jerseys for a double in the Channel Island classes.